Step away from the baby wipes if you want to clean your shoes, bag, or jacket! Yes they’re used all over the world on baby’s delicate skin but the less said about what’s in them, the better. They can (and will) damage the finish on almost all leather finishes and only create a build up of cheap product that is hard to remove. 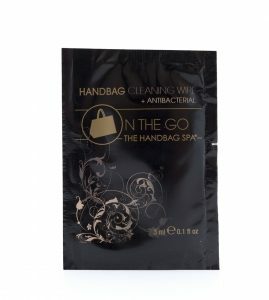 For good handbag care, use a safe product like our on the go wipes. When you’re not using your bag keep it covered in the dust bag provided, and even better, keep it stuffed with acid free paper so that it retains its shape. As tempting as it may be to keep your beautiful bags on display, the sunlight and dust won’t do them any good. It’s an old cliché – but the best advice usually is. 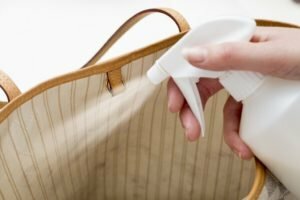 In the case of looking after your leather it couldn’t be more true, from the day you bring your bag home be sure to protect it with a proper leather spray at least once every two months. 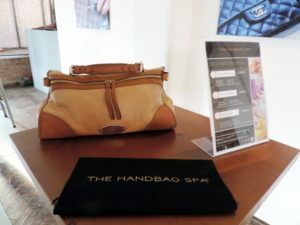 The Handbag Spa sells reputable products that won’t harm your bag like cheaper sprays might. 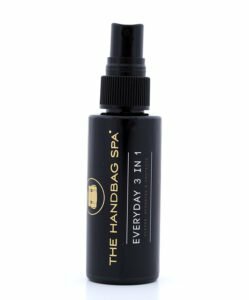 Don’t be tempted to try and remove that ink stain from the outside of your bag or the lipstick mark on the lining – leave it to the professionals who have specialist products that can lift almost anything out of delicate and porous leather. You risk doing more harm than good by attempting a bit of DIY.